A couple of weeks ago, I received an email inviting me to the Seasons 52 Summer Menu Launch event with some fellow food bloggers and media people. I was put on the Seasons 52 radar by my friend Katie at Ruffles & Truffles (check out her site for her post on this launch) so my post cannot begin with a thank you to her for getting me the chance to try out Seasons and experience this event! 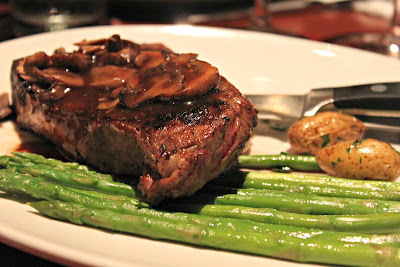 I had never been to Seasons 52 before, but it's been on my 'must-try' list from day one. 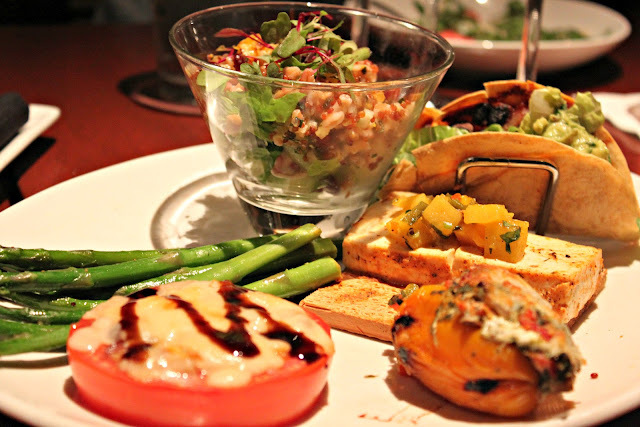 The idea of healthy eating without compromising the taste of a meal is very important to me. We won't go into how I'm faring, but I vowed that in 2012 I would create and indulge in more meals that combined these qualities. In case you are unfamiliar with Seasons 52- every menu item comes in at under 475 calories and the menu changes every season to include seasonally-inspired dishes. Basically, you can eat guilt free and it's guaranteed that you'll never get tired of the menu options. Perfect! Seasons 52 really put on an excellent event. Our night would start with a cocktail reception followed by 4 courses, all of which would be paired with a different wine. When the majority of us had arrived, we were taken to one of the private areas, the Napa Room, to begin. While mingling, we were all treated to flatbread and a glass of the paired wine, Aveleda Vinho Verde. This Portugal wine is so crisp and refreshing and has a lower alcohol content than most wines. The flatbreads were definitely a treat! 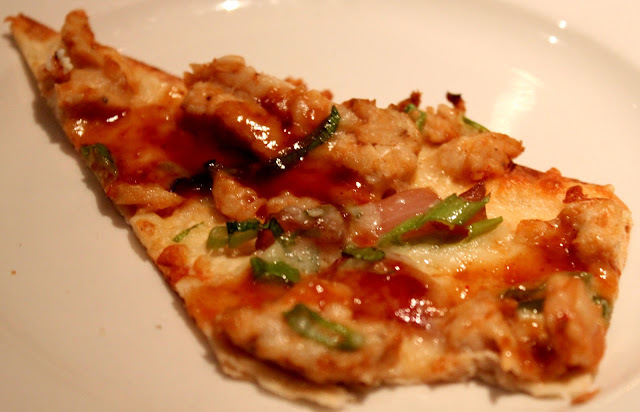 The first flatbread we tried was the BBQ Chicken with balsamic onions, sliced scallions and melted Parmesan. This flatbread was so good! 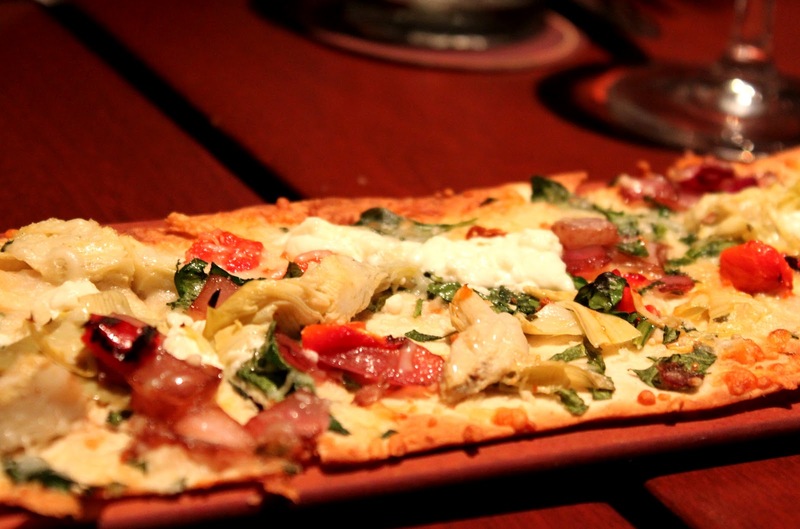 My favorite flatbread, however, was next: the Artichoke & Goat Cheese Flatbread. Topped with leaf spinach, balsamic onion, roasted peppers (and the artichoke and goat cheese, of course), this flatbread was crispy and so delightful. The artichokes were juicy and honestly, I just wanted a whole plate of them. 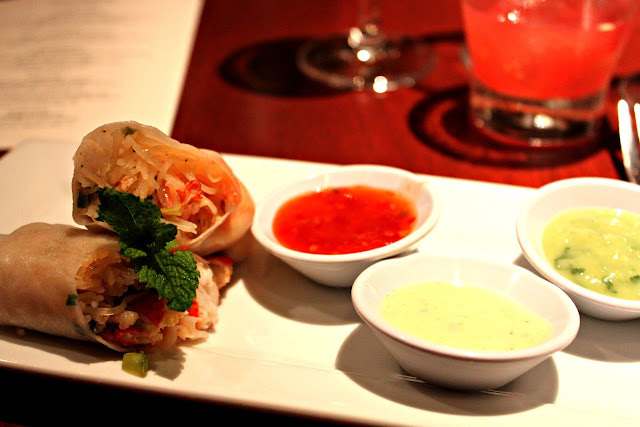 Next up was the first course, the Chilled Lobster & Shrimp Spring Roll. 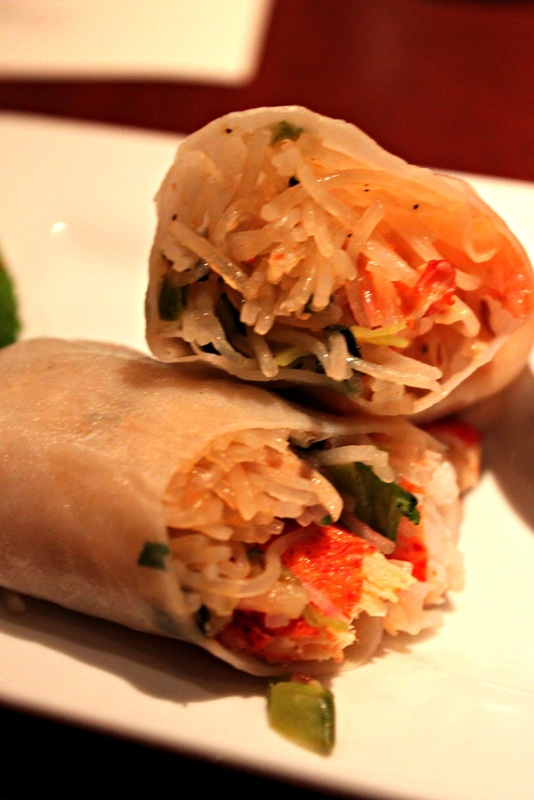 The shellfish are blanched and rolled in the rice paper. Accompanying the roll was a sauce trio consisting of cool salsa verde (made from tomatillo and avocado), aromatic lemongrass (lemongrass and mayo) and sweet-hot red chili (an amazing spicy and sweet variety). All of the sauces worked well with the roll, but the salsa verde option was my favorite. Paired with the spring roll was the Hirsch #1 Gruner Veltliner, an Austrian wine with a nice white pepper aroma- a perfect taste for the asian cuisine. Our second course included a salad and a vegetarian sampling. 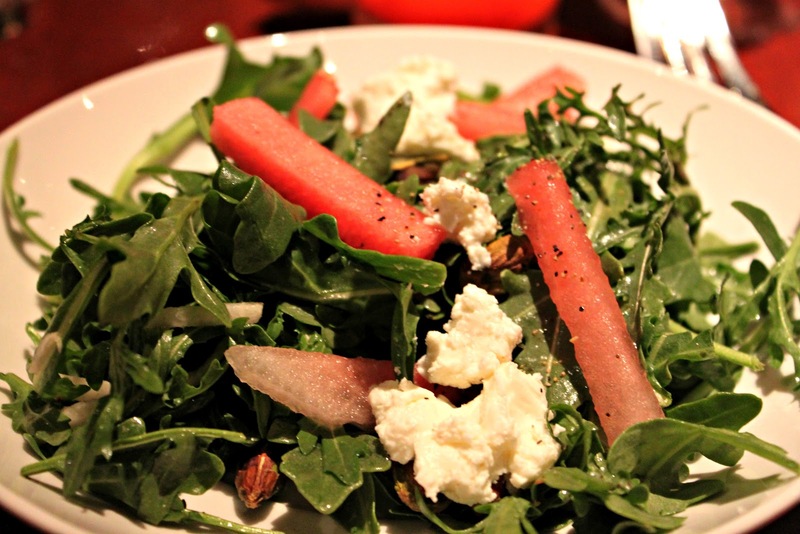 The first, the Organic Arugula Salad, was composed of watermelon, grilled golden beets, goat cheese, jicama and toasted pistachios, served with a light cumin lime vinaigrette. Of course, anything is made better with the addition of goat cheese, but I don't think anyone at the table expected the blend of these ingredients to work so well together. It's certainly not a mixture anyone I've spoken to says they would have thought of. The sampler, Summer Vegetarian Tasting, was certainly interesting and dynamic. The platter consisted of "grains of life" (quinoa and farro with mint and mandarin oranges), a soft taco (mole, salsa verde, black beans), chili relleno (stuffed with spinach, mushrooms and cheese), roasted asparagus, cedar toasted tofu (rubbed with mustard and topped with mango chutney) and a cheese and balsamic tomato slice. The asparagus was perfect and that goes a long way with me. They marinate the asparagus in olive oil, pepper and lemon juice before slow roasting to perfection. My favorite part of the vegetarian tasting was the taco. All of the ingredients really blended together and the crisp taco shell really made it stand out. The second course was paired with Sauvignon Blanc, Honig wine from Napa Valley. The third course included fish and steak. 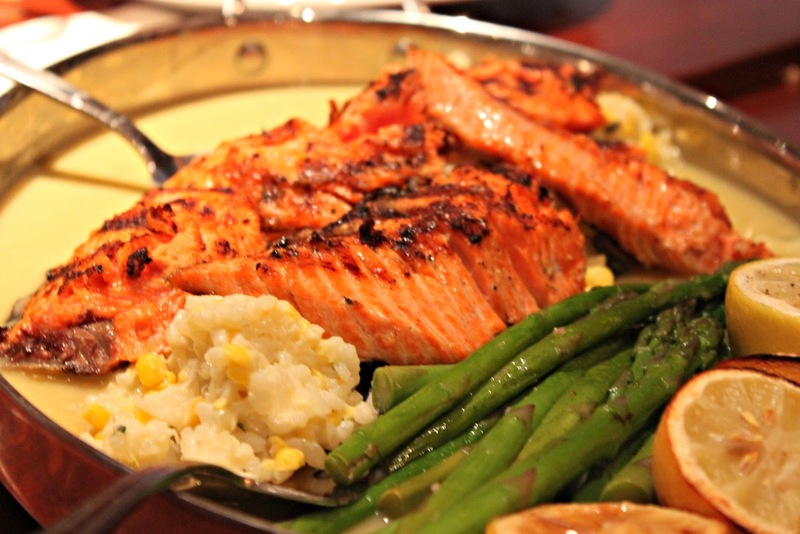 We received the Wild Alaskan Copper River Salmon first, served family-style, with corn risotto, fresh asparagus, roasted pepper and lemon-infused mustard dill sauce. The salmon was paired with Chehalem INOX Chardonnay. For whatever reason, I have always steered clear of all fish with the exception of shellfish. It wasn't until recently that I became open to branching out and trying things that I had previously "shunned". 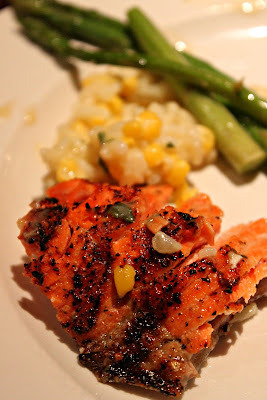 This salmon, surprising me, was my absolute favorite food of the evening. Even though Seasons 52 has salmon on their core, permanent menu, this Copper River salmon is only available by the season for 6-7 weeks. After the salmon, we each received our own 11oz Piedmontese All-Natural Bone-in Strip Steak, served with roasted asparagus, cremini mushrooms and Fingerling potatoes, and paired with the Markham Cellar Merlot. This steak comes from grass fed, all-natural cattle that is naturally lower in calories by 25% due to the lean, double muscled structure of the beef. 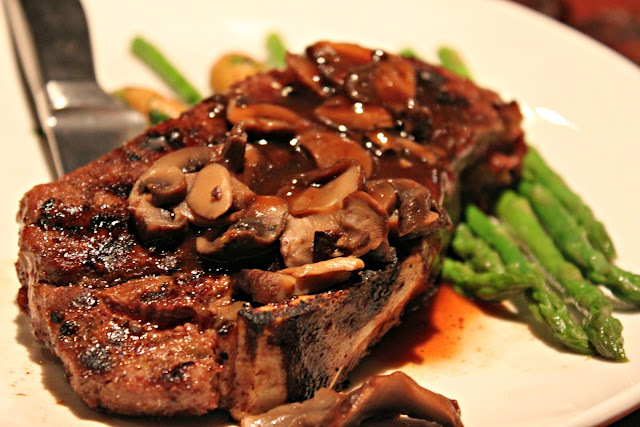 To cook, Seasons 52 used a red wine sauce and made the crust of the steak from black pepper, freeze-dried molasses and lavender. Lastly, we received the Jam Jar Moscato wine to pair with our dessert, the Mini Indulgences. Individual servings of classic desserts, this fourth course was shared and a perfect end to the meal. I tasted samples of the Blueberry Cheesecake, Pecan Pie with Vanilla Mousse, Raspberry Chocolate Chip Cannoli (my personal favorite- the cannoli was so crisp and buttery), Market Fresh Fruit, Strawberry Shortcake and Red Velvet. Other options were Key Lime Pie, Mocha Macchiato, Chocolate Peanut Butter Mousse and Belgian Chocolate Rocky Road. At 2 different points of the evening, we were treated to two cocktails: the Watermelon Refresher and the Strawberry Lemon, both made with Atlantico Rum. 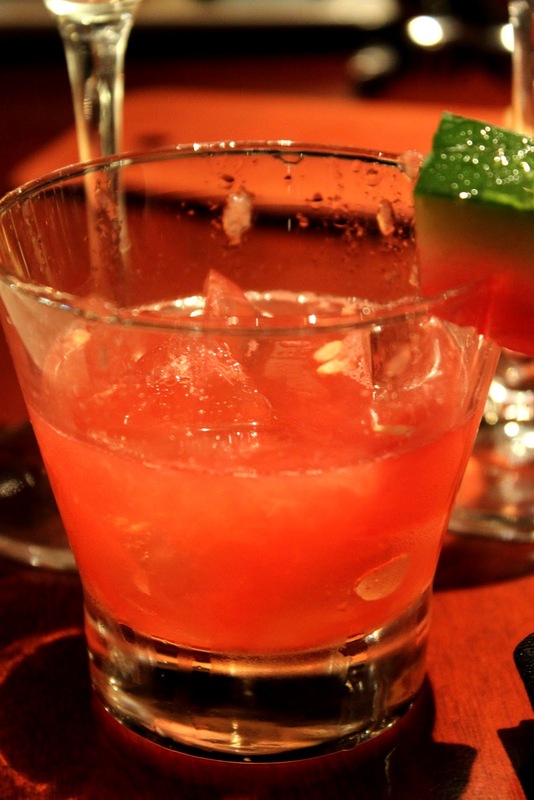 The Watermelon Refresher is made with the Platino Atlantico rum, agave nectar, lime and muddled watermelon. The Platino is clean and smooth with hints of citrus and vanilla, pairing well with the fruit. The Strawberry Lemon is made with the Reserva Atlantico rum, mint, muddled strawberries and lemon. The Reserva rum is a bit drier than the Platino, with hints of light oak and tropical fruits. I loved both cocktails and I'd be hard pressed to pick a favorite. My first time at Seasons 52 will probably go down in the record books as one of the best events ever and I'm so glad I got to participate! 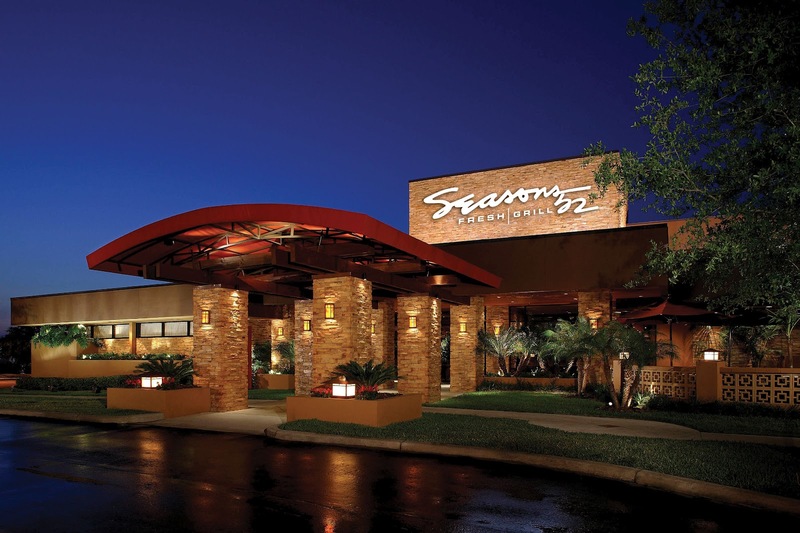 Seasons 52 is open for lunch and dinner, can help with group and event dining and has locations throughout the US. Follow Seasons 52 on Facebook and Twitter! I love their flatbreads! Those look delicious, need to check them out again soon. Mmmmm So jealous of the restaurants you have around you!! Seasons 52 can do no wrong, seriously. It's just so good, and such a great concept. 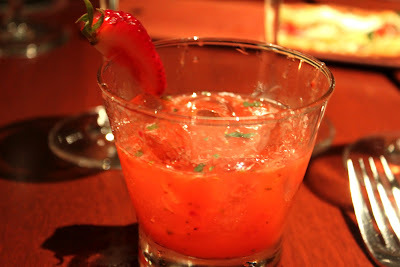 I've always had great service, delicious food, and amazing drinks!